The Richards College of Business programs maintain the highest level of excellence with accreditation by AACSB International in both business and accounting. RCOB faculty are recognized as among leading teachers and researchers in the country and are dedicated to providing traditional, online and experiential learning through degree and certificate programs, internships, mentoring, international opportunities, interactions with executives, and more. Students are considered for admission to UWG based on an admissions index number, which is calculated using a student's undergraduate GPA and GMAT scores. As such, these two items are the most important aspects of application package. At the same time, students are also evaluated based on their letters of recommendation (three are required), and a ...Students are considered for admission to UWG based on an admissions index number, which is calculated using a student's undergraduate GPA and GMAT scores. As such, these two items are the most important aspects of application package. At the same time, students are also evaluated based on their letters of recommendation (three are required), and a short personal statement. In some cases, a student with extensive business experience may be able to receive a GMAT waiver. 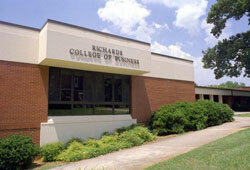 The Richards College of Business at the University of West Georgia offers an “afford­able,” highly accredited business program via evening or web classes that are “great for working students.” Students can work out their own “flexible schedule” by enrolling in MBA courses at the main campus in Carrollton, Newnan and Douglasville. Since many people are here purely to get ahead in their current careers, the environment is often “very work intensive and challenging,” but the “integrity” of the student body and the tremendous support provided by the school makes UWG an excellent fit for the needs and goals of its students. Professors here are what one student calls “the best I have ever had the pleasure to work with,” and are “very knowledgeable, willing to help, and very understanding of needs that come up, be it work, family, etc.” There is great diversity among instructors, and the various backgrounds – both educational and geographic – prove to be “a winning for­mula for our team and the MBA program.” The terrific professor to student ratio feeds into the idea of a “big school with a cozy feeling of being small.” The online MBA program is administered by the University of Georgia system, and is “tops.” “Not only do I get to interact with very intelligent, driven students from all over the world, but I am able to learn from top notch professors from various University of Georgia System universities,” says one student. Professors at UWG are “great to work with,” and students have “always been able to get help” when it is needed. “I have pro­fessors from several different schools in my program, and have seen an overall high qual­ity in both the teaching and the support of the students,” says one. The school's “very fair” administration is “very competent and addresses issues timely and thoroughly,” and “helps students to get the best out of their stay in the school.” “My school understands that there is life beyond school hours and is flexible in both sched­ules and demands,” says a student of the “around-the-clock assistance” provided. Together, the administration and professors have “created an excellent and dynamic learning environment.” “My overall academic experience has been excellent, I wouldn't have picked any other school,” says a student. Want more info about University of West Georgia, Richards College of Business Part Time MBA? Get free advice from education experts and Noodle community members.